A nutritionally dense salad with a healthy homemade salad dressing. Best part is no cooking involved for those hot summer days. Salad Dressing Pour olive oil into bottom of large bowl. Squeeze lemons. Slowly pour lemon juice into olive oil mixture while whisking olive oil rapidly. Peel and crush garlic cloves. Add crushed garlic and dill to olive oil/lemon mixture. Salt to taste. Give final whisk. Main Salad Before making Salad dressing soak frozen shrimp in cold water. Once salad dressing is made drain and rinse shrimp in cold water until completely defrosted. Lightly squeeze shrimp of extra water. 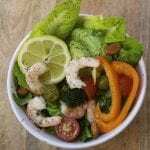 Add shrimp to dressing along with olives, broccoli florets, bell pepper strips, tomatoes, micro greens/sprouts and diced red onion. Make sure to wash all veggies before adding. Toss veggies to coat with salad dressing. Rinse and drain arugula. Add to veggie mixture and toss. Rinse individual leaves of romaine lettuce and drain. Tear or cut into bite size pieces. Add to veggie mixture and toss. Add diced avocado and almonds as final step and toss. Enjoy!